The ClareVision encoder lets you integrate analog cameras into ClareVision (or other) IP video surveillance solutions. 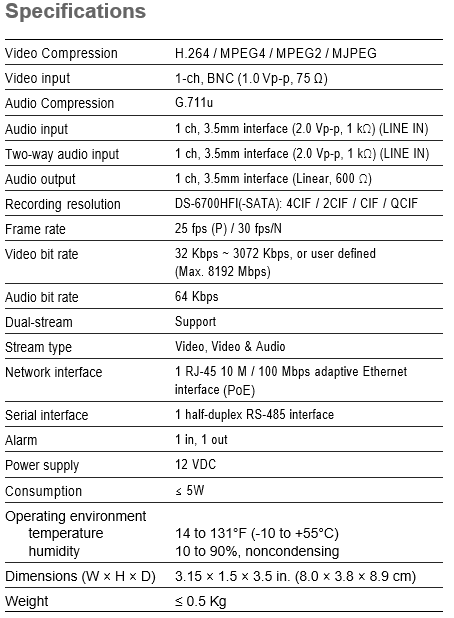 The single-channel PoE device supports video encoding at up to 4CIF in a variety of common video standards across multiple network protocols. 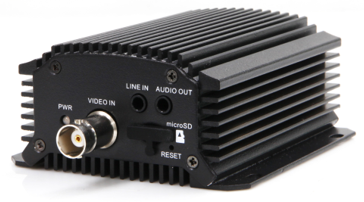 The encoder streams video from a single camera with or without two-way audio. 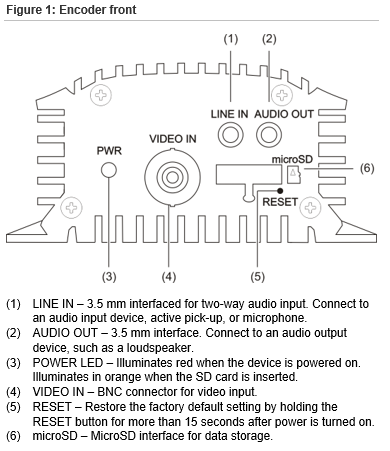 Remove all contents from the encoder packaging and ensure you have the following items. Caution: This encoder is not approved for outdoor use. Only install this product in an indoor environment. The encoder kit contains four screws for mounting the device to a solid surface. 1. Place the encoder against a solid surface, and then mark the location of the mounting holes. 2. Remove the encoder, and then drill the four mounting holes. 3. Position the encoder, and then attach it to the surface using the screws provided. 1. Connect the camera to the encoder’s BNC connection labeled “VIDEO IN”. 2. (Optional) Connect an audio input device, such as a microphone, to the port labeled “LINE IN”. 1. Connect one end of a shielded network cable to the encoder port labeled “LAN” and then connect the other end of the cable to one of your router’s network ports. 2. 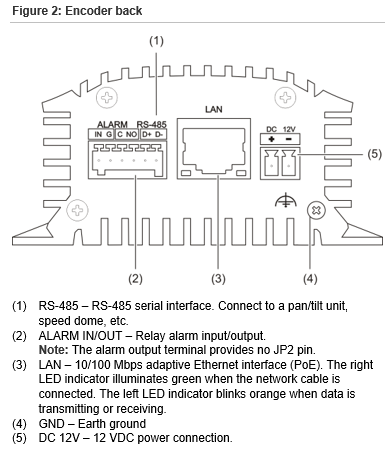 Insert the 6-pin terminal block into the port labeled “ALARM” and then optionally connect external input/output devices – for example, alarm devices. 3. Attach a grounding wire to the encoder using the grounding screw, and then attach the other end to your rack or other ground. You can store video directly to a microSD memory card inside the encoder. 1. Insert a microSD card (not included) into the port labeled “microSD” on the front of the encoder. 2. Check to be sure the card is in the correct orientation. A 2-pin 3.5 mm terminal block is used for power input. 1. Insert the 2-pin terminal block into the outlet marked “DC12V”, making sure that it is seated properly. See Figure 2, item 5. 4. Attach the other end of the power adapter to and AC outlet. 5. Check that the indicator LEDs to verify the correct conditions. This will reset all parameters, including the IP address, to the factory default settings. 1. Ensure the encoder is powered off. 2. Insert a rigid object, such as the end of a paper clip, into the Reset hole, and then press in and hold the button for 15 seconds. See Figure 1, item 5. To view and configure the encoder via LAN (Local Area Network), you need to connect the encoder in the same subnet with your PC. Then, install the SADP software to search and change the IP of encoder. 1. To get the IP address, use the SADP, a software tool that can automatically detect encoder in the LAN and list the device information like IP address, subnet mask, port number, device serial number, device version, etc., shown in the figure below. 2. 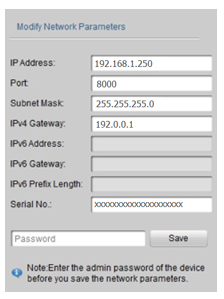 Change the IP address and subnet mask to the same subnet as of your PC. After launching the SADP software, it automatically searches the online devices every 15 seconds from the subnet where your computer is located. It displays the total number and information of the searched devices in the Online Devices interface. 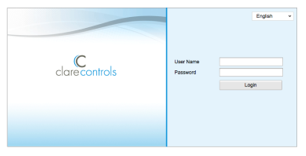 The interface displays the device type, IP address, port number, and gateway. The camera takes 15 seconds to show up online, and 45 seconds to show offline when it is removed. Click Refresh Every 15s to refresh the online device list manually. Click the arrows on each column heading to change the order of the displayed information. Click right arrows to show the device table and hide the network parameter panel, or click the left arrows to show the network parameter panel. 1. 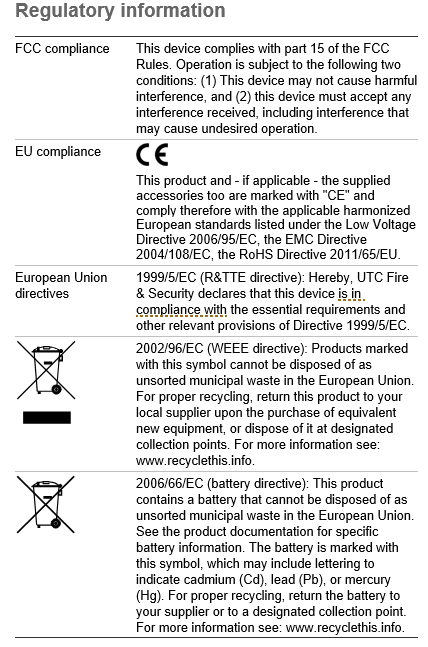 Select the device to be modified from the device list as shown below. 2. The network parameters of the device will be displayed in the Modify Network Parameters panel on the right side as shown below. 3. Edit the modifiable network parameters – for example, IP address and port number. 4. Enter the password of the admin account of the device in the Password field and click Save to save the changes. 5. Enter the IP address of encoder in the address field of the web browser to view the live video. When accessing the encoder from different subnets, set the gateway for the encoder after you log in. 2. In the browser address bar, enter the IP address of the encoder – for example, 192.168.1.250 and press Enter to display the login interface. 3. Enter the user name and password, and then click Login. 4. 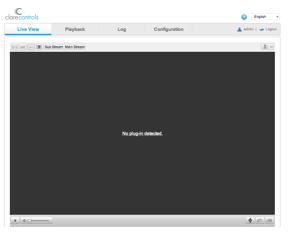 Install the plug-in before viewing the live video and managing the encoder. 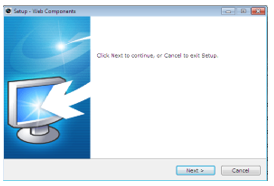 Follow the installation prompts to install the plug-in. You may need to close the web browser to finish the installation of the plug-in. Mac’s require the plug-in to be downloaded manually. See the Clare Controls ClareVision IP CCTV Dashboard to download the plug-in. 8. Reopen the web browser after the installation of the plug-in and repeat steps 2 and 3 to login.